Remember Charice Pempengco from Glee? She doesn't look like THIS anymore! It’s been a little over a year since former Glee actress Charice Pempengco came out as a lesbian, and if we didn’t know any better we’d have a difficult time recognizing the 22-year-old singer today. Back in March we told you that Charice was nearly unrecognizable when compared to the petite, long-haired performer we saw on Glee, and it seems like she’s only continued to embrace her new persona. In March Charice was sporting no makeup, a partially shaved eyebrow, and super short hair, and a new photo from July 20 tells us that look is here to stay. Charice before the come out. 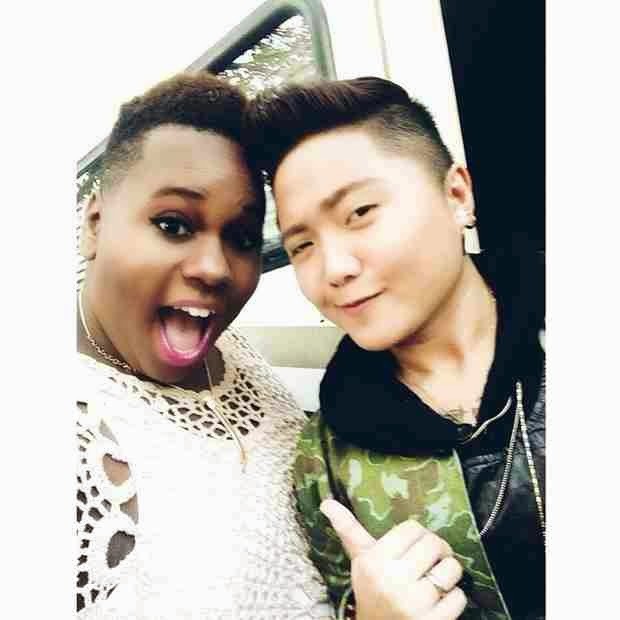 Glee star Alex Newell (Unique) had a run-in with the Filipina singing sensation and couldn’t resist sharing it on Instagram. “OMG look who it is!!!! @OfficialCharice Yay! !” he captioned the photo of the pair. In the snap, Charice’s hair is as short as we remember and she’s ditched the colorful ensembles she used to wear in favor of a much more muted outfit. Alex, on the other hand, is rocking a knit top and bright lipstick. We’re not sure why Charice and Alex crossed paths, but we certainly hope their run-in was Glee-related. We were under the impression that filming for the sixth and final season won’t start until next month at the earliest, but it’s possible they had an early meeting with the Powers That Be. Afterall, music producer Adam Anders revealed last week that he’s already hard at work on the first song of Season 6, so you never know! Charice Pempengco and her girlfriend covering one Ariana Grande song!